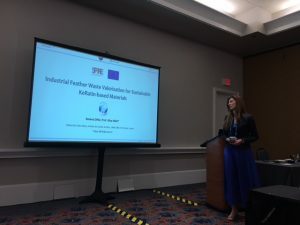 The Institute of Chemistry of Nice UMR CNRS 7272 presented KaRMA2020 project with an oral communication at the 257th ACS Spring National Meeting: 31st March – 4th April 2019, Orlando (USA). ACS organizes two national meetings & expositions each year, and each one attracts an estimated 11,000 to 13,000 chemists, chemical engineers, academicians, graduate and undergraduate students, and other related professionals. During the meeting, scientists present new multidisciplinary research, hear the latest information in their areas of professional interest, and network with colleagues. Programming is planned by 33 technical divisions that cover all scientific fields, secretariats that focus on multidisciplinary programming, and ACS committees. Each meeting feature more than 7,000 presentations organized into technical symposia that highlight important research advances with over 250 exhibitors showcasing new technological developments.